I love it so much! I love everything about this movie. It brings so many memories from my childhood. My inner little girl - also fangirl - was so on point throughout the movie. The movie is directed by David Yates - yep, that person who gave you an amazing final of Harry Potter. We can see his best work in this reboot. The flawless camera angles, CGI, and plot from one to another. Soft and detailed storyline but yet, leaving us something to remember. 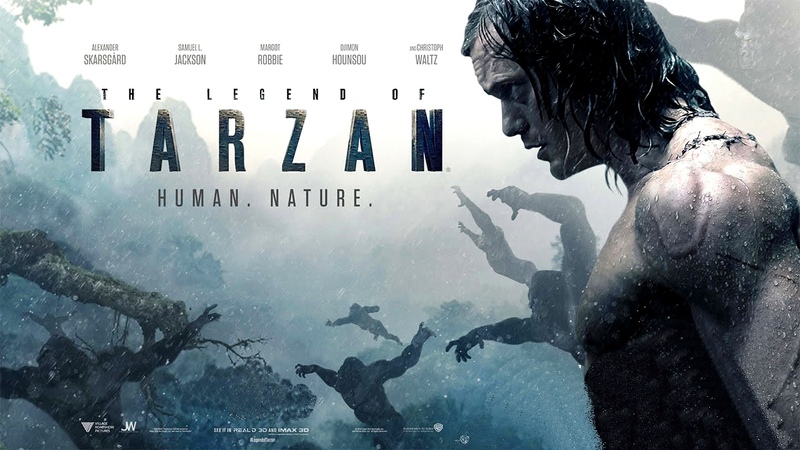 This movie is not your typical Tarzan and Jane movie because it takes time 10 years after Tarzan moved to London, England with his beloved wife, Jane. Now, the ghost on the trees, the man who raised in the jungle, the guy who understood animals, was known as John Clayton. Alexander Skarsgard is the only guy who can played Tarzan in this modern era. He portrayed Tarzan perfectly: his gaze, his voice, his behaviour, his well building body - damn those abs! are so on point! I can't even remember when was the last time I adore someone who swinging from one tree to another shirtless. Nope. Alex's Tarzan is gentle, kinder, and more human version and we positively agree. Like mama always said, 'find a guy who can be gentle and wild at the same time' and here he is everybody! I like how intelligence and kind John Clayton is, how he grew up and tried so hard to be a human when he was raised to be an animal. How he accepted and respected his legacy to be the one and only heir. But when he's in the jungle, we saw both. Yes. We saw John Clayton and Tarzan in one and that's fantastic! "a normal man can do something impossible for someone he loves. my husband is no normal man." - Jane Clayton. Our girl crush, Jane played by Margot Robbie is not bad herself. She's so luminous and so Jane. We remember Jane's bravery and faith and I saw it on Margot's Jane. The combination of lady-like and girl from the jungle. She gave us another lesson to know when you have to be strong and brave. I think she should be little girl's role model. She's smart, has a big heart and brave. She has John/Tarzan, who can do everything for her, but yet she doesn't dependence on him because she can protects herself. With what? her amazing bravery. Their endless love story is something that really enjoyable and give you all the feelings. They love each other like none. They trust each other more than someone can trust anyone. Ladies, if this love story doesn't give you tears and faith of true love, I don't know what it is. Needless to say, this movie is an amazing, breathtaking one. Have to say this is the best Tarzan movie I've ever watched.